Many developments in the past week, so I’ll apologize with the caveat that I’m really happy with how things went. We’ll end the travelogue strong this week and, next week, we’ll start off with next steps. That’s right… everybody gets a little homework. My meeting with the Korean Confederation of Trade Unionists started a little late but, by that point, it was to be expected with our crew. We arrived for our sit down in the now familiar KCTU hall, this time in a conference room. I was clear with my comrades on the trip that during these meetings I was going to be quite greedy and a little rude. I needed to make the most of my time, ensuring that I would spend it talking about issue areas that I knew would matter to labor unions back home, so I started with my own questions. Since I know Korean trade unions aren’t exactly a subject people study in school these days, I’ll do you the solid I hadn’t done my fellow delegates and give you a little background. KCTU really came to be in the mid-1990s, but its origins come from the Democratization movement that basically came to an astonishing head in the summer of 1987. Prior to that, South Korea was ruled by a military dictatorship. To overcome it, there needed to be a wide coalition across all social movements. Folks came together (forgive me as I’m really truncating this story) and after a long fight, there were elections that summer. From this movement, many groups emerged including trade union organizations. Between July and September of that same year, over 1000 labor unions were organized. But there are some key differences that are worth considering. First, this is a young confederacy and they are still in the streets. The government is not their friend – even the guy they helped get elected recently – and there’s a considerable amount of challenge to the labor organization. This means that their level of fight back is wicked strong and they spend a lot of time mobilizing membership against larger social movement issues. While many imagine that to be an organizer’s paradise, there are disadvantages to constantly putting thousands in the streets for months or years at a time. Second, in South Korea the election cycle is fairly different. Once you file your certification cards, if you’ve got a majority that’s the proverbial ball game. Further, two workers make a union and you don’t need to get recognition from the employer. Unions make it known they are present early enough that it isn’t exactly a surprise but it is imaginable that this is an entirely different environment than organizing in the United States. A lot of the unions that form are yellow (fake, fugazi, counterfeit) as a result but this can also mean huge successes. After brief introductions, we got right into it. For me, the biggest issue we’re dealing with is the age problem in the United States. Union membership is on the decline so statistically membership data shows an aging base. Within USLAW it is a pronounced problem that has required an incredible amount of energy to confront. I was curious about how their organization was confronting this issue. They informed me that they had the same problem. Their approach, however, differed from ours in that they instead have focused on being a voice on issues that affect young people even if they don’t affect their base. On the affiliated union level, each union has its own program that the KCTU supports strategically. My next questions were about KCTU’s current political prisoners, the former president and acting president. I was wondering why, if they got this new guy elected, why he didn’t let them out of jail. The unsurprising response was that the Moon administration, even with its claims to be the fulfillment of the Candlelight Uprising, is limited in its power to come through on its promises. To protect its ability to negotiate with conservatives in government, they sacrifice their alignment with a powerful labor movement. This meant that the special pardons they thought were coming would likely not arrive without significant pressure. She proceeded to communicate with them in Korean for a moment or two and, after much back and forth, they all raised their hands. The explanation that followed was the best surprise I’d had so far. When South Korea was going through the Democratization effort there was a great deal of redbaiting. Naturally this was partly because of the war but also (maybe mostly) was because it was a useful tool to neuter workers looking to organize. These charges were apparently leveled at unions in particular and, because of this, coalition-building became an essential part of the foundation of the organizations created. When you’re in a fight to the death like the one they were in, backs against the wall, victory was to be found in solidarity. These alliances have not been perfect, but they had survived Japanese colonization and years of military dictatorship while living under the specter of war prior to Democratization so they weren’t unfamiliar. When it came time to be together, it just made sense. Social justice unionism is about integrating labor into other movements so, after their explanation that the DNA of struggle in South Korea has always been defined by this need for solidarity, I understood why the phrase wouldn’t make sense. For them it wasn’t about integration. The connection had been there from the start. And the hand raising? Well, Wol-San had asked how they identify politically and one person said “radical syndicalist.” Apparently the others agreed and showed that agreement with a raising of hands. After we were finished with questions, I looked at Wol-San with a grin. Before I left for Korea, I stopped at the local liquor store for some Kentucky bourbon. That in itself is a good story that I’ll use later. Getting it into the country was tricky but, after some negotiating, I managed to bring in two bottles. The one I ended up presenting to General Secretary Lee was a bottle of Jefferson’s Ocean. I informed her that this bourbon is special in that it crosses the equator multiple times by boat before it is ever sold, picking up the flavors of the world and integrating it with Kentucky bourbon. I let her know that just like its flavor, it brings with it a world’s worth of solidarity and love. There was no translation needed for what was communicated (“ooh” “wow” was what I heard from all the leaders) and she said under better circumstances we’d have a drink after hours together. 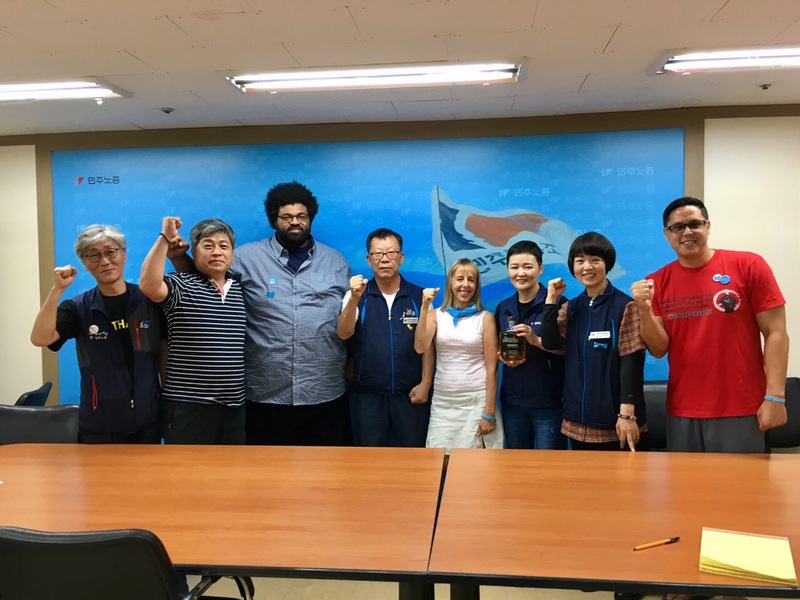 I laughed, knowing sneaking a six foot four Black man into a closed South Korean union hall was unlikely, but informed her that I’d be back (hopefully with more of us) and I’ll gladly take her up on that when I do. We took some photos together and then it was time for the next meeting: KCTU’s unification committee.